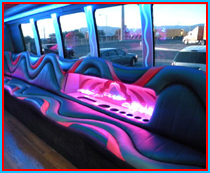 Plan memorable parties with the help of Las Vegas Party Bus Rentals. Located in Las Vegas, Nevada, we offer various bachelor party and bachelorette party packages as well as party bus rental services. Perfect for weddings, birthday parties, night owls, or just a special night out, we'll bring the fun to you in our custom party buses. Give us a call at 702 763-0058 or Email us here. Now you and your friends can dance all night long without stopping using one of our two 24-passenger buses. Each bus is custom designed and built to be the best by our team. Your friends will love traveling to the hottest spots in our bus that features a TV, LED lighting, a bar, a sound system with sub woofers, and a stripper pole. We offer our rental services by the hour so you can party in a way that fits your budget. To learn about our packages, contact us at (702) 763-0058 in Las Vegas, Nevada.